Converting documents from Doc to TXT helps to cut the size of document storage, if memory space is limited. You can simply export old documents to TXT, creating backup copies, compact in size and convenient for sharing and viewing. Being supported by all text editors, TXT format will be definitely read without any problems. 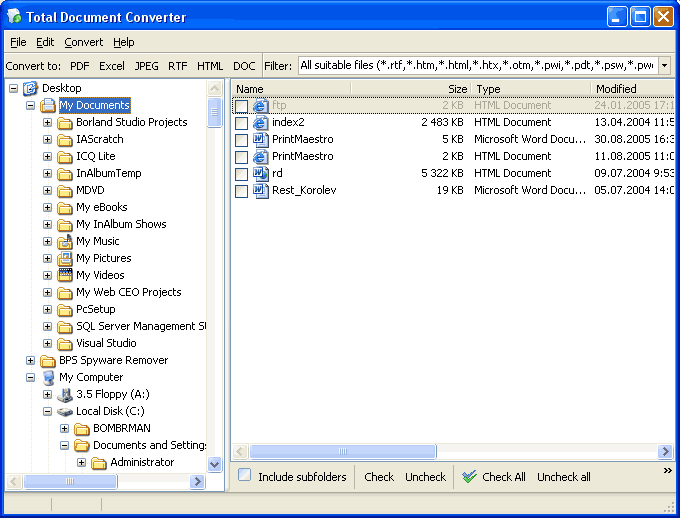 CoolUtils offers Doc TXT converter for web-server that gives ability to process conversions from multiple users at once. Just install the package to your server, and your network users will be able to convert their Doc files to TXT in batch. Besides converting files locally, Total Doc Converter X is suitable for integration to web-based applications. If you have a website that needs converting functionality, use this SDK to implement converting features to web based interface. For converting Doc into TXT through web-server, CoolUtils provides you with ActiveX. This technology is given together with Total Doc ConverterX SDK. Setting destination for the future TXT copies. All these features are defined via command line, as for this Doc to TXT converter no GUI is available. It is handled via command line with all conversion settings represented in text. All parameters are defined easily, it takes seconds to set proper conversion procedure. The command consists of a few parts like program call, address of sources, destination address, target format and conversion parameters. If you do not need to change anything in sources, just need to get their exact copies in TXT format, you do not need to specify any additional parameters. Download this Doc to TXT command line converter here.